Many people have been asking me to weigh in on the controversy that is erupted this week with the publication of Dr. Kaayla Daniel’s report arguing that fermented cod liver oil (FCLO) produced by Green Pasture is rancid, low in fat-soluble vitamins, made from pollock rather than cod, and adulterated with trans fat-containing vegetable oil. While I would ordinarily want to thoroughly research all the unanswered questions in my mind before publishing something, the requests for my thoughts have been numerous enough that I would like to publish them as they currently are. First, I would like to disclose potential contributions to an appearance of conflict of interest, and then briefly introduce how my thoughts had evolved over time on this matter in the years leading up to Dr. Daniel’s report. Dave Wetzel has given me a large amount of free cod liver oil and skate liver oil over the years. If I remember correctly, years ago he paid me for permission to publish an article I had written about cod liver oil on his site. I had already written the article, I did not own the rights to it, and he could have legally published it on his site without asking permission, so technically that was a small monetary gift. Overall, I consider the value of these gifts as a proportion of my income to be negligible. I have had a contractual relationship with the Weston A. Price Foundation (WAPF) for years, in which I receive compensation as an independent contractor for various forms of writing, speaking, and consulting. This constitutes a minor but significant proportion of my income. WAPF also paid for a semester of undergraduate courses I needed to apply for graduate programs in 2006 and funded my postdoctoral research at the University of Illinois. Years ago, I was a chapter leader for the Foundation, which is a volunteer position. I am not and never have been an employee of the Foundation. The Foundation endorses the FCLO, and Dr. Daniel’s report has called this endorsement in to question. At no time did I ever play any direct or, to my knowledge, indirect role in the decision to endorse the product. I do not sell Green Pasture products or any products of their competitors, nor do I earn commissions for the sale of these products. No one at WAPF, Green Pasture, or any of Green Pasture’s competitors asked me to write this blog post and I am not receiving any compensation from anyone for writing it. Although I have always had total creative control over my Mother Nature Obeyed (MNO) posts and have always written and published them without any prior review by anyone in the Foundation, I am writing this blog post here rather than over at MNO to emphasize the complete independence of this post from my contractual relationship to WAPF. I started using cod liver oil after reading Nutrition and Physical Degeneration and Nourishing Traditions, probably somewhere around early 2002. This was one of many dietary changes that I made during this time, which were, together, associated with radical improvements in my health. I have never seen cod liver oil as a necessity; instead, I have seen it as a convenience. Price used it in his practice not because the healthy non-modernized populations he studied used it, but because it was a convenient way to increase the fat-soluble vitamin content in the diets of people who needed it. It provides retinol, the physiologically essential form of vitamin A, which can also be obtained from most animal livers, and, in smaller amounts from other animal fats, particularly butter and egg yolks. It provides vitamin D, which can be obtained from sunlight, many fish, and in lesser amounts from terrestrial animal fats, particularly butter and egg yolks. It provides EPA and DHA, of which I am mostly interested in obtaining DHA, and this can also be obtained from fatty fish and, to a lesser extent, from terrestrial animal fats. In general, all these are more available from terrestrial animals raised on grass and in the sunshine than from terrestrial animals raised on grain and in confinement. It is easier to add cod liver oil to an imperfect diet than to perfect the diet, and for many people the most balanced approach to obtain all of these nutrients will be to consume a small amount of cod liver oil while also trying to hit the other dietary bases more often than not, allowing the cod liver oil to relieve the need for dietary perfection. I do not recall what dose of cod liver oil I used early on, but it was never my only major source of retinol because I had, from the beginning of my venture into this way of eating, been eating copious amounts of buffalo liver. I read Nutrition and Physical Degeneration even before I read Nourishing Traditions, and Price writes very clearly therein that cod liver oil is most beneficial in low doses but toxic at high doses. Further, exposure to Mary Enig’s writings made me skeptical of large amounts of polyunsaturated fatty acids (PUFAs). Later, exposure to Ray Peat’s writings made me even more skeptical. Peat and Enig disagreed over the value of cod liver oil because Peat took a more extreme stance against PUFAs. I never fully agreed with Peat, but I did come to believe that it is desirable to get adequate physiologically essential PUFAs (which I see as arachidonic acid and DHA) and fat-soluble vitamins (in this case, A and D) without unnecessarily increasing the total PUFA content of the diet. This led me to use smaller doses of cod liver oil while avoiding polyunsaturated plant oils and getting additional vitamin A, if I felt I needed it, by increasing my consumption of liver. Years later, for example, I had slacked on my vitamin A intake and found myself with a buildup of scaly material in my scalp; suspecting vitamin A deficiency, I used a combination of daily cod liver oil and liver until it went away. In recent years, I have settled into the practice of using small doses of cod liver oil in the colder part of the year when it is harder to obtain vitamin D from sunshine and relying more on liver for my vitamin A during the warmer part of the year, during which I would use cod liver oil primarily as occasional immune support when I felt I needed it. Nevertheless, there was definitely a very common “more is better” approach to cod liver oil within the community, especially in the early years. Dr. Ron was one of many people using multiple tablespoons of cod liver oil per day. One of my friends had been a patient of his and for a long time took 2-3 tablespoons on his advice, and later became concerned that she developed a thyroid disorder because of it. Another friend used doses like this and she was convinced it gave her food intolerances. From what I can recall, both of these instances occurred prior to the introduction of fermented cod liver oil. It was this second friend, Laurel Crosby, now a researcher at Stanford, who introduced me to the research showing that arachidonic acid metabolites are necessary for immunological tolerance to foods and that high doses of EPA from cod liver oil or fish oil could interfere with this. I have since incorporated this into my public lectures on cod liver oil. Eventually, Dave Wetzel of Green Pastures released his fermented cod liver oil. Initially, it was one more option on the market. Eventually, it came to dominate. From talking to people in the hallways of the WAPF conferences and reading through emails that people send me, I got the impression that some people saw it as an improvement while some people felt they did not tolerate it as well or did not receive as much benefit from it. I suspect in both cases it was sometimes due to actual health-related reactions to the oils while sometimes it was due to the perceived naturalness of the product or its flavor. I imagine that a great many people who jumped on the cod liver oil bandwagon after Green Pasture began selling the fermented product exclusively took it as their first cod liver oil and might not have personal experience to compare and contrast fermented and unfermented cod liver oils. My first introduction to a serious criticism of the ideas behind the fermented cod liver oil was in 2012 when the Rosita extra virgin oils were being prepared for the market, and I was copied on private email exchanges with individuals associated with that company arguing that cod livers cannot “ferment” only “decompose,” and at a much later time, email exchanges questioning the finding of vitamin D2 in the FCLO. These products became competitors to Green Pasture products around the same time that I began delivering a regular presentation on cod liver oil at the regional Weston Price conferences in 2013. As a result, questions from audience members about which is better began in earnest at that time. I have always refused to take a clear position on these questions for two reasons. First, I thought it was great that high-quality fermented and unfermented products were becoming equally available to consumers and I didn’t want to get involved in disputes where the dividing line so clearly sliced directly and unambiguously between two competing companies. Second, I genuinely didn’t buy arguments for the superiority of either oil. Few subjects connected with materia medica have provoked so much discussion as the comparative merits of the light and the dark grades of cod-liver oil. Formerly, the brown oil was considered superior in efficiency to the paler sorts, and was generally favored for medicinal purposes. In recent years, however, chemists have claimed that analysis does not reveal any substance in the dark oil which would account for greater beneficial activity than the paler grades are supposed to possess. While many physicians yet recommend the brown oil, the drift of public opinion seems to favor the pale oil, and certainly it is more popular with the patients. 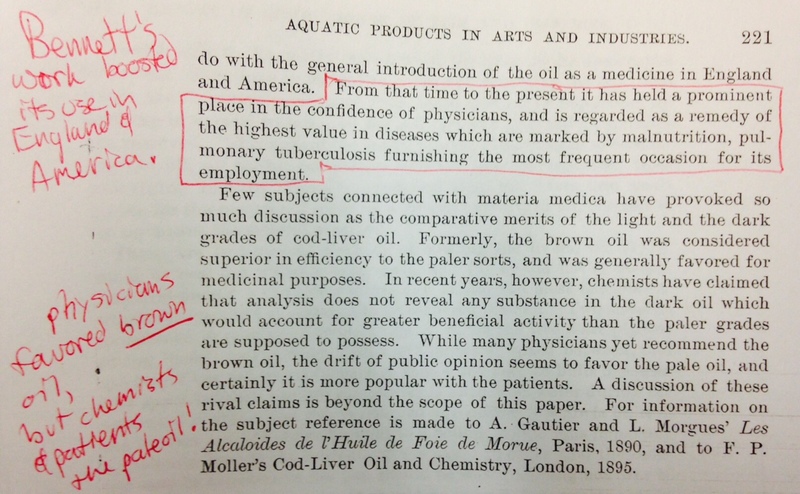 I do not have sufficient expertise in the history to evaluate this statement, but if it is true, it suggests to me that the nineteenth century successes with cod liver oil were primarily with the brown oil and that the twentieth century successes were primarily with the light oil. Further, it strikes me as particularly fascinating that they cite the absence of anything in the oil found by chemists to support the contention of physicians that the brown oil is better. While the observations of physicians were not based on randomized controlled trials, at least they involved clinical endpoints that people knew existed, were readily observable to the naked eye, and that people cared about. Clinical observations from the nineteenth century cannot be taken uncritically, but they should be taken seriously. That chemists couldn’t find something in the nineteenth century should be dismissed without any consideration at all. Chemical analysis had yet to discover even the existence of vitamins, and it would be years before anyone would make a convincing case that anything beyond protein, carbohydrate, and minerals were essential in the diet. And yet it is almost certainly the vitamins in the cod liver oil, unknown to early chemists, that played the primary role in boosting immunity. Based on this rudimentary understanding of the issue, I have held the impression that both oils are beneficial and that the reasons for one or the other being favored through history have never been strong ones. Consequently, I have always thought it best that consumers simply have access to both types of oil and decide for themselves which they would prefer to purchase. With the publication of Dr. Daniel’s report, this controversy has exploded, and, although I do not believe I have all the answers, I feel finally compelled to address the issue to the best of my ability. What follows is my preliminary response to her report. Whether I write more will depend on whether further information arises that compels me to modify or further develop my thinking on the issue. The idea that cod livers could be fermented is ludicrous on the face of it. Lactic acid bacteria show a stunning capacity to degrade different carbohydrates and related compounds into the primary end product of lactic acid. But they have very limited capacity to synthesize the amino acids of protein and none at all to synthesize fats! Fermentation requires carbohydrate, which is why it is most often associated with vegetables, grains, and dairy. 1. Any spoilage of food by microorganisms (general use). 2. Any process that produces alcoholic beverages or acidic dairy products (general use). 3. Any large-scale microbial process occurring with or without air (common definition used in industry). 4. Any energy-releasing metabolic process that takes place only under anaerobic conditions (becoming more scientific). Of these definitions, only #2 could imply an absolute requirement for carbohydrate, because glucose is the precursor to lactic acid and ethanol in most industrial uses. Lactic acid is most directly derived from pyruvate, which is the end product of glycolysis, a process that more or less splits a glucose molecule in half; amino acids and the glycerol component of fats can also be converted to pyruvate, so I doubt that sugar is the universal precursor for microbial lactic acid production, but it is the overwhelmingly usual precursor to lactic acid in all well characterized lacto-fermented foods. In any case, definition #2 is a “general use” definition that isn’t considered scientific by this textbook and is much more restrictive in nature than both the other general use definition and the industrial definition. The textbook uses definition #5, which is a biochemical definition, and lists the following as substrates for fermentation: “sugars or other organic molecules, such as amino acids, organic acids, purines, and pyrimidines” (p. 134). It seems to me that in the communities that value fermented foods as health foods we tend to use a definition similar to #1 but with the opposite connotation, implying the process produces a healthful product. Most of us would refer to sauerkraut as fermented cabbage, but in the biochemical sense (definition #5), the cabbage doesn’t ferment, only its carbohydrate (and maybe some other minor substrates) does. It is the whole of the microbial metabolism responsible for the characteristics that differentiate sauerkraut from cabbage, and it is that (subjectively) desirable microbial metabolism that we usually have in mind when we colloquially use the word fermentation. The biochemical definition (#5) is not limited to microbes or to food. When we engage in high-intensity exercise, our muscle cells ferment glucose to lactic acid. While a scrawny guy may be taunted with the question, “bro, do you even lift?” he would never be taunted with “bro, do you even ferment?” A technically accurate response to such a question might be, “Nah, bros can’t ferment, just my glycogen does when my workout is all glycolytic.” No one looks at the person breathing hard after a heavy exercise session and calls the person “fermented,” but the purpose of breathing hard is to obtain enough oxygen to get rid of all the lactic acid that had been produced by muscular fermentation during the exercise. Conversely, microbial metabolism is not limited to fermentation. Microbes possess cellular respiration, which fully breaks down carbohydrates, fats, and proteins for energy (Tortora, p. 137-8). When we talk about fermentation in the context of microbial metabolism of food, the whole of microbial metabolism includes the use of lipids and proteins for energy, not just carbohydrate. When we talk about it in the biochemistry sense, it is not necessarily even related to food. I like the approach that my textbook uses, to recognize the diversity of uses of the word. It follows from that approach that we should use common sense when interpreting what someone means when they use the word. According to Green Pasture, the phrase “fermented cod liver oil” technically means the oil of fermented livers. In a colloquial sense of having been metabolized by microorganisms, this seems accurate. I imagine that fermentation in the biochemical sense has occurred in the livers to one degree or another. I assume there is some glycogen in the liver that ferments in this sense. I do not know whether there is carbohydrate in the starter mix used for the fermentation. I do not know what organisms are in the starter mix and feel confident that no one knows the full range of microbes that participate. Even when well characterized and standardized starter cultures are used in a fermentation, other organisms invariably become involved. I do not know if the amino acids or the glycerol of its fatty acids are fermented in the biochemical sense. To me, this is not a scandal: the microbial processes involved simply are not well characterized. While I think a discussion of the different definitions and best uses of the word “fermentation” is meritorious, I do not think using the word according to one of its general use or industrial use definitions can be considered fraudulent. I also do not see how the specific mode of energy metabolism used by the microbes that metabolize the livers necessarily has any implications for the healthfulness of the oil, which can be studied independently by looking at what it contains and its biological effects. So in the specific context of an introduction to a report accusing Green Pasture of fraud and alleging that the FCLO is categorically unhealthy, the discussion strikes me as a red herring. Dr. Daniel does discuss some practical health implications of whether the livers are fermented. She notes, for example, that if they were fermented in a way that models how the Inuit buried meat until it became “high,” there would be a botulism risk. She had the oil analyzed for pathogens, however, and reported that none were detectable. She criticizes the oil for having a pH less acidic than that of a typical lacto-fermented food, and notes that Dave Wetzel has reported even an even less acidic pH, and she concludes from this that the oil does not benefit from acidic preservation. Technically, an oil does not have a pH: pH is a measure of the acidity of an aqueous solution. Regardless, this is a grossly oversimplified view of food preservation. Lactic acid fermentation preserves the “food” in the sense that it prevents spoilage by other undesirable microorganisms, but it does not preserve all of its components. It breaks some things down, synthesizes other things: changes the food. Some nutrients are best preserved by acid, such as vitamin C or thiols like glutathione. Some nutrients are best preserved by avoiding exposure to light, or to certain wavelengths of light, such as riboflavin and vitamins A and K. In an oil, we are primarily concerned with oxidative degradation of the polyunsaturated fatty acids (PUFAs). Coconut oil is stable over years because it is very low in PUFAs; this is true despite little antioxidant protection, especially in the refined oil, and despite no effort to preserve it with acidity. In a marine oil rich in highly unsaturated PUFAs, stability is primarily conferred by antioxidants. Liver is rich in all sorts of compounds that could act as antioxidants, such as thiols (protein thiols, thioredoxin, glutathione, etc), lipoic acid, and others, probably with a lot of variation in fat solubility and the ability to migrate into an oil extract. Microbial metabolism of the livers adds a whole layer of who-knows-whats-in-it. I imagine it would be time-consuming, arduous, and require a lot of intellectual creativity to fully characterize the compounds within the oil and determine what, if anything, is acting as an antioxidant. While I consider the semantic discussion of “fermentation” in the beginning of the report to have little practical value, I wish more consideration had been given to the semantics of the word “rancidity.” Throughout Dr. Daniel’s report, the term “rancidity” is dealt with as if it had a singular meaning, and I believe the failure to distinguish between the different types of rancidity led to a flawed conclusion about whether the fats in the oil have been damaged. In this section, I will address the distinction itself. In the next section, I will address whether the FCLO is rancid. Chemical changes of several types contribute to what is known by the generic term rancidity. In its broadest meaning, rancidity denotes a deterioration of flavour and odour of fat or the fatty portions of foods. Such deterioration can be due to hydrolysis, oxidation, or to microbial action. The term rancidity is used in the dairy field to indicate hydrolytic deterioration; in other fields it denotes microbial deterioration, and to the fat chemist it means autoxidation. Hydrolytic rancidity results from lipolysis of triacylglycerols in which the released fatty acids give a distinct taste to the oil. This is usually reserved for the lauric fats or butter to which the shorter chain fatty acids can give a soapy taste. The third form of rancidity is called ketonic rancidity and results from microbiological attack on lauric fats, which first liberates short-chain free fatty acids and then subjects them to a beta-oxidation, yielding methyl ketones and aliphatic alcohols. It is closely related to hydrolytic rancidity. From a mechanistic perspective, these are three different and independent processes. From a food industry perspective, they are three independent ways to achieve the same undesirable result: off-flavors. The thinking here is that as double bonds oxidize they form peroxides (primary oxidation products), which, though odorless and tasteless, are precursors to a wide range of secondary oxidation products. . . . Sadly, there are few, if any, convincing studies that show good correlation between peroxide and or anisidine and taste panel sensory scores. . . . For triacylglycerols rich in LCPUFA, these methods are equally inappropriate. Sensory evaluation of the oil or food product containing the oil is the only reliable method of deciding whether the oil is fit for use, but this is no easy task and recruiting, training, and maintaining the panel can be difficult. . . . Factors associated with or even responsible for the fishy taste and smell of a marine oil are not well defined. There are many kinds of fish oil and many different ideas of what constitutes rancid fish oil. The strictest judges are the professional taste panels of the food industry, who can fail an oil that less experienced people might think has only just began to go rancid or that is perfectly suitable for food use. When Holman wrote that the “fat chemist” is concerned only with oxidative rancidity, this is because his field was studying the biological health-related effects of the process. He identified three concerns: loss of antioxidants, loss of essential fatty acids, and the creation of toxic byproducts of damaged fatty acids. This is not to say that the processes have no relationship to one another at all. Obviously if they are all happening simultaneously they will all get worse over time. Free fatty acids are, all things being equal, more vulnerable to peroxidation than fatty acids joined in ester bonds (as in triglycerides, for example). But hydrolysis of triglycerides to free fatty acids is not a requirement for peroxidation to occur, and peroxidized lipids will fragment into secondary oxidation products, not convert to free fatty acids. In tissues with enzymatic systems, such as muscle tissue, peroxidation can induce hydrolysis of free fatty acids from phospholipids in cellular membranes, but as far as I know this should not be relevant to a food oil. Without ignoring some potential interrelationships, it is important that we recognize these as distinct processes when we consider the question of whether the FCLO is rancid. In asking the question of whether the fermented cod liver oil is rancid, my concern is specifically whether it demonstrates a history of lipid peroxidation. With a few minor exceptions discussed further below, Dr. Daniel found that the FCLO had acceptably low levels of lipid peroxidation products as measured by the peroxide, anisidine, Totox, and TBARS tests. However, the FCLO had high free fatty acids and a high acid value, which reflects the high free fatty acid content. This data is consistent with what Green Pasture has claimed about its product. However, Green Pasture has taken the absence of lipid peroxidation products to indicate the absence of rancidity. Dr. Daniel argues that the peroxide, anisidine, TOTOX, and TBARS tests are only useful for oils in early stages of peroxidation and takes the high free fatty acids as demonstrating a past history of peroxidation. In other words, the oil has been so extensively peroxidized that all of the peroxidation products have gone and the free fatty acids have shot through the roof. Dr. Daniel summarized her argument for David Gumpert very similarly, as quoted here. When I first read this, I was concerned. I had always found the claim that the FCLO was immune to rancidity to be difficult to believe, and it had crossed my mind in the past that the oil might not peroxidize at room temperature because there is nothing left to peroxidize. I never had the time to think deeply about it or look into it any further, so this remained nothing more than a passing thought and I kept taking the FCLO through the years. But one thing just didn’t add up, and caused my skepticism to grow. If we take at face value the claim that the secondary peroxidation products eventually degrade and become undetectable, we have to assume that the oil is so extensively peroxidized that these products are no longer being generated in detectable amounts. As antioxidants are depleted (and as free fatty acids increase, if hydrolysis is also progressing simultaneously), the fatty acids become even more vulnerable to peroxidation, so even if the peroxidation products were unstable, they should increase over time rather than decrease as the rate of peroxidation accelerates, until the peroxidation is so thorough that there are few PUFAs left to peroxidize. I discussed this with Chris Kresser, and we came to the conclusion that the ~1 g/tsp of EPA and DHA seems relatively normal for a cod liver oil and doesn’t seem indicative of such a scenario. A few weeks ago, a specialist in lipid peroxidation had reached out to me to discuss EPA and DHA supplementation. I emailed him about this and sent him a copy of Dr. Daniel’s report. He told me that although it is true the peroxide value will decline with time as the peroxides fragment into secondary peroxidation products, the indicators of those secondary products (anisidine, Totox, and TBARS) should remain high even in a very extensively peroxidized oil. He also agreed that the level of EPA and DHA was inconsistent with extensive peroxidation, and told me that free fatty acids are not an indicator of past peroxidation. He declined to be publicly acknowledged, however, so he remains an anonymous source. I tried (within the limitations of the time I had) to find actual data on what happens to these values in an extensively peroxidized oil and was unable to find any. My anonymous source was confident from autoxidation experiments performed within his own laboratory that the assessment above is correct, but was unable within the limited timeframe and given his other responsibilities to point me toward published data demonstrating this. The figure does not show actual data. Instead, it graphically depicts the importance of measuring the anisidine and Totox values. As free radicals and oxygen initially attack PUFAs, they generate peroxides, and the peroxide value increases. As the peroxides fragment into secondary products detectable with the anisidine test, the anisidine value increases. When the rate of peroxide fragmentation finally exceeds the rate of peroxide formation, the peroxide value falls while the anisidine value continues to climb. The Totox is a calculation that combines the results of both tests, so it climbs throughout the process. This reference does not support and seems to contradict Dr. Daniel’s contention that the anisidine and Totox decrease with extended peroxidation and that free fatty acids indicate past peroxidation. It seems, moreover, to support the concept that the free fatty acids in the FCLO reflect microbial digestion of the oil. The second reference is a book. The cited pages (220-222) are not available in a Google Book or Amazon preview, and the book is expensive. It seemed doubtful that these three pages had the smoking gun of actual data showing the decline of the anisidine value with extensive peroxidation, but I did not want to miss that possibility. So I emailed Dr. Daniel about this and asked if she could clarify how she came to this conclusion, and, if the book was critical to the conclusion, that she send me copies of the relevant pages. She responded that it was difficult to find data on such extensively peroxidized oils in the literature or in books, so her conclusions about the oxidation products eventually falling to normal levels in such oils were derived from personal conversations with experts in the field. It is worth noting that the aforementioned tests (their limitations discussed in more detail below) are extremely crude, rough-around-the-edges tests that are used so extensively because they are inexpensive and can be run with widely available equipment. WAPF sent samples to Dr. Martin Grootveld of the Leicester School of Pharmacy, who performed more sophisticated NMR-based techniques to analyze the oil for a range of peroxides and aldehydes, finding none detectable. The results are available here. Grootveld’s group published a paper where they used this method to detect high levels of toxic aldehydes in restaurant fryer oil and in commercially available PUFA-rich oils that they experimentally subjected to heat. They found only low levels when they subjected commercially available olive oil, coconut oil, lard, and beef fat to the same heating process. These aldehydes are secondary products of lipid peroxidation and they correspond to what would be picked up by the anisidine value test. The difference is that the anisidine value test is comparatively cheap, easy, and non-specific, whereas the NMR test is comparatively expensive, difficult, and very specific. The Grootveld group noted in their conclusion that primary lipid peroxidation products are not absorbed in the diet but secondary products are, and it would thus seem that high concentrations of the secondary products are what we should consider to be of toxicological interest. Notably, the Grootveld group stated within that paper that they found primary oxidation products (corresponding roughly to the peroxide value test) in linoleic acid that they kept in the dark exposed to atmospheric oxygen for about three months. This suggests that under such conditions it takes much longer than three months for the peroxides to decline to normal levels. If it is true that the secondary peroxidation products eventually do the same, it would have to take even longer. While I am willing to consider arguments that the secondary peroxidation products would disappear in an extensively peroxidized oil, I am unconvinced of this claim for the time being. While I do not think the presence of relatively normal EPA and DHA levels indicates in and of itself that no peroxidation has occurred, I think it indicates clearly that the peroxidation has not been extensive enough to wipe them out as material for continuing peroxidation. If the oil is undergoing peroxidation and there is plenty of material to continue to peroxidize, I do not see how markers of peroxidation could drop to acceptably low levels. I do not see any convincing evidence that free fatty acids are clear signs of past peroxidation. Altogether, then, I do not think the oil demonstrates a history of lipid peroxidation, and in the sense of the “fat chemist,” I do not believe it is rancid. While this is my conclusion about Dr. Daniel’s central argument, I will discuss two caveats below. First, I would like to address whether the free fatty acids, agreeable by all parties to be present, are harmful to consume. Are Dietary Free Fatty Acids Toxic? Dr. Daniel states that “Free Fatty Acids are so cytotoxic to cell membranes that the body makes it a priority to build them back into the safe triglyceride form as quickly as possible.” This statement is part of a brief discussion suggesting that the FCLO is harmful because of the free fatty acids themselves. The potential toxicity of free fatty acids is true, but is pulled grossly out of context. When we digest food, we hydrolyze fats to free fatty acids and monoglycerides before absorbing them into the intestinal cell, where they are repacked into triglycerides. Some authors argue that long-chain omega-3 fatty acids are more bioavailable when supplemented as free fatty acids. This is controversial, but it is notable that there are scientists even conducting studies of free fatty acid supplementation, which would not be the case if it were obviously harmful to consume free fatty acids. Free fatty acids elevate within our bodies in both good and bad contexts. When we burn fat for energy, whether derived from our diet or our adipose tissue, we hydrolyze fats into free fatty acids so we can break them down during beta-oxidation. This increases in the context of fasting between meals, exercise, or consumption of a diet richer in fat or lower in carbohydrate. These processes are normal and healthy. In the stress response, our body senses the need to release large amounts of stored fat, so free fatty acid levels elevate. Insulin prevents the release of free fatty acids, so in insulin resistance free fatty acids also elevate. These free fatty acids can compete with glucose for energy metabolism and thereby contribute to elevated glucose. They can also inhibit the biological activity of thyroid hormone. If cells are overwhelmed with more free fatty acids than can be efficiently burned for energy, they can also have toxic effects and increase the vulnerability to oxidative damage. But this is not an intrinsic toxicity of free fatty acids; it is the harm they cause during metabolic derangement. Clearly, eating free fatty acids is quite a different phenomenon than free fatty acids rising endogenously. But it is not that different a phenomenon from eating triglycerides, which we break down into free fatty acids before absorbing them anyway. The main difference is that when we eat free fatty acids they have already undergone that step of digestion. Dr. Daniel cites a video in which Dave Wetzel discusses the time-dependent peroxide value history of his oil, wherein he says that it rises to a high level and then returns to normal before he bottles the oil. In response to the Daniel report, Wetzel released data in pdf form on the same topic. He had told me about this phenomenon years ago, and, as noted above, it had crossed my mind that this was harmful. In reviewing it now, the phenomenon does sound eerily similar to the natural course of peroxide formation where it increases until the peroxides degrade into secondary products that are toxic. Yet Wetzel’s data show that the anisidine value, an indicator of secondary peroxidation products, never rises to unacceptable levels over the same time course. A few possibilities would be consistent with this: 1) the peroxides did not rise high enough to generate unacceptable levels of secondary peroxidation products, 2) the peroxides formed and then were converted to something other than secondary peroxidation products, or, discussed in more detail below, 3) the peroxide value test was picking up something besides peroxides. Dr. Daniel’s data show no evidence of unacceptable anisidine values. She infers from Wetzel’s video and from the high free fatty acids that the anisidine value had been high and has since declined. But Wetzel’s data shows no history of unacceptably high anisidine values, and if we take his peroxide value data seriously we should also take his anisidine value data seriously. The peroxide value test is the activator X test. In my 2007 article On the Trail of the Elusive X-Factor: A Sixty-Two Year Old Mystery Finally Solved, I described this in detail in the sidebar, “The Activator X Test.” It not only detects peroxides, but anything capable of oxidizing iodide to iodine, including quinones such as coenzyme Q10, and, almost certainly, vitamin K. The principle of the test as currently used is the same as in Price’s day, and its limitations remain the same. Does the quinone content, or the content of anything else capable of oxidizing iodide to iodine besides lipid peroxides, vary over the course of the processing of the oil due to microbial activity? I don’t know, but nothing seems implausible about it. I find Wetzel’s description of the peroxide value test concerning enough that I want to see these questions elucidated, but not damning enough to convince me that the oil is extensively peroxidized in the face of no evidence of secondary peroxidation products. Although the Daniel report primarily shows an absence of secondary lipid peroxidation products, there are two outliers cited: one out of three TBARS tests done for the report showed a high value, and a conference abstract published by Standard Process Laboratory found 10 times more “MDA” in a fermented cod liver oil (presumably the Green Pasture product, though not specifically named) than in other cod liver oils. Before discussing these results, it is necessary first to give some background about the TBARS test. Although this test is often referred to as a test for malondialdehyde (MDA), one of the secondary lipid peroxidation products, this is erroneous. MDA is only one of many compounds that are picked up by the test. TBARS stands for TBA-reactive substances. TBA stands for 2-thiobarbituric acid. In the assay, you mix TBA with the sample and heat it. The more substances in the sample that react with TBA, the more intense of a pink color is formed. Finally, you stick the sample in a machine called a spectrophotometer, which measures the intensity at which your sample absorbs light at a specific wavelength. The very name of this test — TBA-reactive substances — is an admission that it is not a measurement of MDA, or of any specific chemical. This test is widely criticized for its lack of specificity and for the possibility that colored components of a sample could cause interference. The fact that you have to heat the sample to cause the “substances” to react with TBA is also concerning, because heating oils can cause the formation of MDA and other TBA-reactive substances. I have some personal experience measuring MDA. In my doctoral lab, we would measure MDA using high-performance liquid chromatography (HPLC). It is a similar procedure, except that we would inject the sample into a HPLC, which would then separate all of the individual components. This allowed us to separate MDA from all the other TBA-reactive substances and quantify the MDA specifically. We would always add butylated hydroxytoluene (BHT), an antioxidant, to the sample while heating it to prevent the formation of MDA during the procedure. Protocols for the TBARS test do not call for this, which makes me think that MDA and other TBA-reactive substances are probably created during the typical procedure. Furthermore, carrying out the procedure on 100% analytical grade ethanol would make the ethanol turn pink and generate a considerable amount of “MDA.” I doubt that 100% analytical grade ethanol has MDA in it. In all likelihood this wasn’t actually MDA, so we would always run an ethanol blank to appropriately adjust for the noise. I find the TBARS test difficult to take seriously. It may be a rough but decent first indicator of peroxidation when comparing the same type of oil over time or between batches, but it should not be used to infer peroxidation without confirmation from other tests. Certainly, it should never be referred to as a test for MDA, because it is not specific to MDA. The probability of generating a false positive seems high, and this is especially true without proper care to prevent artifactual formation of TBARS. Finally, comparing different oils with different pigmentation strikes me as questionable. The Standard Process abstract says MDA was measured with a “calorimetric assay.” That they weren’t separating the MDA chromatographically indicates to me that they were using the TBARS test and calling it “MDA.” Thus, “MDA” should not be used without quotation marks when referring to this study. Dr. Daniel states in the associated footnote of her report that “The study was only published as an abstract and Standard Process declined to share the complete study or specific data.” I therefore did not try reaching out to them to obtain the same information. In this case, they were comparing a fermented cod liver oil (presumably the Green Pasture product, but this is not stated) to other cod liver oils. But certainly these cod liver oils are different colors, so to run a calorimetric (color-based) assay on them without chromatographically separating the components strikes me as highly questionable. One of the three labs that Dr. Daniel had analyze the FCLO found high TBARS, while the other two found very low TBARS. She cites three TBARS values from the Green Pasture web site that were all low. WAPF lists eight TBARS results that were all very low. If the same lab had found most batches to have low TBARS but certain batches to have high TBARS, I would be inclined to think that the aberration was a result of interbatch variation, that some batches may have been spoiled, and that more quality control was needed. If a number of laboratories find low TBARS and one finds high TBARS, I’m inclined to think the aberration is an analytical error. This case seems closer to the latter. Altogether, it seems to me the balance of the evidence favors the conclusion that the FCLO has not undergone a significant history of lipid peroxidation and does not contain toxic lipid peroxidation byproducts. After discussing rancidity, Dr. Daniel moves on to the topic of biogenic amines. I agree with most of the material in this section, except the implication that the presence of amines in the FCLO means it is a poor quality product. Dr. Daniel cites Green Pasture’s claim that the tyramine content ranges from 5 to 50 ppm. Two batches manufactured in late 2013 or early 2014 and submitted by Dr. Daniel to labs #2 and #4 showed either no detectable amines (lab #4) or low levels of amines (lab #2). A batch manufactured in 2012 and submitted in August, 2013, to lab #7, found very high levels of amines, including putrescine and cadaverine, often associated with putrefaction or rotting. I do not have any expertise in testing amines and cannot comment on the strengths and limitations of the tests involved. It is unclear whether the disparity in the results reflects differences in laboratory methods, differences in laboratory competence, or difference in amine content between batches. According to data assembled by WAPF, some cheeses have considerably higher levels of amines, even putrescine and cadaverine, than what lab #7 in the Daniel report reported for FCLO. Not every fermented food is good for every person, and some people don’t tolerate fermented foods well at all. I think this is largely mediated by the biogenic amine content. I suspect that some negative reactions some people experience with FCLO are due to the amine content, and I find this far more plausible than that people are being harmed by toxic byproducts of lipid peroxidation in the oil. The next section of the Daniel report argues that the fat-soluble vitamin content of the FCLO is low. A appears significant, but lower than claimed by Green Pasture; E and K are very low, but this is not very surprising for a cod liver oil; D is surprisingly low. I am not going to comment extensively here, because I have an article on the nature of vitamin D in cod liver oil coming out in the next Wise Traditions. This has been in store for a while, so it is not a direct response to Dr. Daniel’s report, but it deals with the same topic, and I don’t want to spill the beans before it’s out nor be redundant. I also discussed this topic with Chris Kresser, and he wrote about our conversation already. I will therefore address this topic briefly. The vitamin D activity in cod liver oil is likely from a variety of vitamin D metabolites. Dr. Daniel collected laboratory data using very high quality methods of analytical chemistry, and they are probably very accurate about the vitamin D2 and D3 contents of the samples. This does not mean that they accurately convey the biological vitamin D activity. Wetzel submitted his FCLO for a test of its ability to prevent rickets in rats, and this test found high levels of D activity. It’s true that the biological vitamin D activity of the FCLO could be different between rats and humans, but not having a gall bladder does not allow a rat to absorb something that does not exist. So if high quality analytical methods show that there is not enough “vitamin D” to cause these effects in rats, there must be other compounds with vitamin D activity that are doing the job. Interestingly, the Standard Process data linked to above in the discussion of TBARS and MDA found that only their fermented cod liver oil sample and crude cod liver oil samples contained vitamin A2, or dehydroretinol. While I think the vitamin A story is less complicated than the vitamin D story, the existence of vitamin A in this unusual form within marine life could perhaps cause similar errors in underestimating the vitamin A potency of an oil. Dr. Daniel criticizes Wetzel’s speculation that the quinones in his FCLO could possess vitamin K activity and supports this criticism with data showing that it is low in vitamin K. I agree that, at this time, it cannot be claimed that these quinones do possess vitamin K activity, but showing that they are not vitamin K does not disprove this. Analytical chemistry can explain biological effects, but it cannot confirm or refute them. Biological effects are shown with tests of biological effects. At present, the idea remains an interesting speculation. Dr. Daniel argues that the FCLO is made from Alaskan pollock rather than cod. This is based on a higher than expected ratio of EPA to DHA more reflective of pollock than cod, and DNA analysis showing that the livers used for his Cattle Lick product are Alaskan pollock. Of these, the DNA analysis seems most reliable. Assuming that some or all of the FCLO is made from Alaskan pollock as this suggests, the ethics of the labeling is well beyond my area of expertise. I know from reading old papers that pollock was legally considered cod liver oil in the 1930s (as discussed here, for example), but I don’t know what the current laws require or what the current industry standard is. Certainly, this warrants an explanation from Green Pasture. I will await hearing from Green Pasture before coming to an opinion about the legal and ethical issues surrounding this question. I do think it is self-apparent that consumers benefit from greater transparency about the sources of a product. If Green Pasture were to determine that there is no ethical or legal responsibility to distinguish between species in the cod liver, I would hope they would begin clarifying this in their labeling anyway. Dr. Daniel also reports 3.22 percent trans fat in the oil, the majority of which is 18:3 trans, presumably derived from 18:3 cis (alpha-linolenic acid). Since pollock liver oil does not contain enough 18:3 cis to account for this 18:3 trans, she argues, it must be added. She concludes that this must have come from a thermally damaged vegetable oil that Wetzel is adding to the FCLO. She then considers the possibility that Wetzel is taking the cost-cutting step of buying bottled pollock liver oil that, unbeknownst to him, is diluted with thermally damaged vegetable oil, then fermenting that oil. In such a case, she argues, he would be fermenting livers for the Cattle Lick product purely for the sake of duping visitors into believing that the FCLO is made from fermented livers. The first possibility strikes me as reasonable speculation; the second as wild speculation. If the test results are accurate, then the fatty acid must come from one of the following: 1) the diet of the fish, 2) endogenous synthesis by the fish, 3) microbial production, 4) adulteration. I find 1 and 2 less plausible than 3 and 4 simply because if 1 or 2 were true, the fatty acid should be regularly found in these fish at similar concentrations, though I would not consider them impossible. Given how little we know about the microbial process involved, and the rapidity with which our understanding of microbes is constantly expanding, 3 strikes me as quite plausible. 4 is certainly simpler, because it is well established from common experience that producers may adulterate their products. Fraud is a major accusation, however, so while evidence of its possibility should by no means be swept under the rug, it makes sense to me that Green Pasture deserves the chance to respond and the benefit of the doubt until dialog or debate can lead to a firm conclusion. I think it is worth noting that the lab test does not seem to distinguish whether the 18:3 trans is all-trans, or is conjugated with alternating cis and trans double bonds. I think further elucidating the nature of the fatty acid may help shed light on where it comes from. Is the Butter Oil Rancid? Data from the Daniel report show the butter oil has high free fatty acids and a high peroxide value. The free fatty acids in that sample indicate hydrolytic rancidity, not a toxicological concern, but probably able to explain the off flavors some people reported. 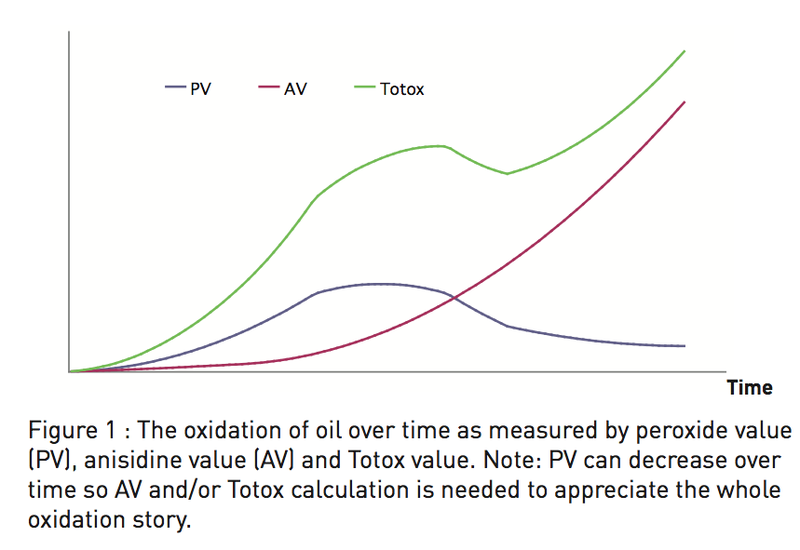 The peroxide value could indicate peroxides, but since the peroxide value test is the activator X test, so it could also indicate vitamin K and other quinones. Vitamin K: Still Activator X? One of the last conclusions in the report is that vitamin K2 is probably not activator X after all. I argued that it was in my 2007 article, On the Trail of the Elusive X Factor: A 62-Year-Old Mystery Finally Solved. This strongly suggests that vitamin K2 might not be Dr. Price’s elusive “X Factor.” Dr. Price was specific that it was butter oil — and not just butter — that had healing power and a potent synergizing effect on cod-liver oil. Clearly, it’s time to test a variety of butters, butter oils and ghees not only for vitamin K but for other potentizing factors. Until then it looks like vitamin K2 is not Dr. Price’s mysterious “X Factor” after all. Price used large amounts of butter in his protocol and small amounts of butter oil. The purpose of the butter oil was to concentrate the activator X, not to uniquely supply it. He quantified activator X with the peroxide value test, which is not a specific test for any chemical compound, but picks up a variety of compounds. Presumably his conclusions about the value of producing the butter oil were based both on the observation that the “activator X” test value was higher and that it seemed more potent in his animal experiments and clinical experience. Given the lack of specificity of the test and the difficulties of discerning cause and effect of specific components in the context of complex interventions, I think we need to take all of Price’s clinical observations seriously, but not uncritically, and I don’t think it makes sense to let the identity of activator X hang on any one statement that Price made. That said, the two most relevant questions here are 1) is the Green Pasture process for making the butter oil the same as Price’s? and 2) is it concentrating the vitamins from the cream used to produce it? The correct way to determine the latter is to compare the vitamin value in the cream to that in the butter oil, or to compare the process of making butter from that cream to that of making butter oil from that cream. My argument that vitamin K2 is activator X was based on a wide range of evidence including the biological and chemical behavior of the vitamin in addition to its distribution in foods. I welcome thoughtful critiques and counter-arguments, but something larger than a comparison between a few different butter and butter oil products is needed, in my view, to dismiss my argument wholesale in this way. In an ideally functioning market, competition between producers will lead to competition for greater transparency and greater quality. When consumers are critical and some people act as watchdogs, this helps the market function in that way. I think competition among cod liver oil suppliers in the ancestral health community is a good thing, and I think critical analysis of these products is a good thing. Toward that end, I appreciate Dr. Daniel for offering a critical analysis of the Green Pasture products. At the same time, I find the antagonistic tone of the report to be unfortunate, and many of the accusations reach beyond what the evidence should allow for. If this report stands on its own, I do not think Green Pasture gets a fair hearing. However, if this report initiates a reasonable dialog about these topics and leads to a greater supply of information through more rigorous and sophisticated testing and a competition between companies for greater openness and transparency, I think everyone will benefit. Toward that end, I hope my critique of the critique contributes well to that type of dialog. so whats the fuss about using alska pollack in the name of cod ?? Thank you Chris for your research and diligence in continuing to answer questions posted by many who apparently have not read your original articles. I have read this one 3 times and still, I have a hard time understanding the science completely. Perhaps a more in-depth synopsis would help those of us with science challenged brains would be helpful! My comments are based on years of practical use for myself, my family and my acupuncture patients. I have been taking FCLO for years and continue to do so, having very good results with far fewer colds/flus, digestive improvements, less inflammation, etc. My son avoided a root canal a dentist recommended by taking a little more than recommend dosage of FCLO…his tooth pain disappearing after 3 doses, never to return. This is all he did for that. I also have almost all of my acupuncture patients on Green Pasture FCLO, and those who don’t drink raw milk also get the butter oil. I’ve only had one patient have reactions to where they could not take the FCLO in the 10 years of recommending it, and this person had Hep C, very compromised liver enzymes, and low tolerance to any fermented food products. The only other objections from my patients to the Green Pasture products resulted from the dramatic accusations online from Kayla Daniels against the products. I have many elderly patients who took Cod Liver Oil as children, and not one of them ever said it was not bad tasting. That leads me to believe that what Green Pastures is selling is similar to what has been sold on the market for many, many years by older companies. I continue to recommend the FCLO and Butter Oil for my patients, with very good results. Most take the capsules because of the fear of the taste. I take the liquid with a raw milk chaser and since milk is an emulsifier, this seems to break up any residual CLO in my mouth. I am pretty picky about strong tastes and have no problem with the FCLO taken this way. I have taken other CLO products in the past that are heat extracted, and had way more “taste issues” than ever with the GP FCLO. I’m late to this conversation. However, I find it noteworthy that Dr. Terry Wahls – whose research and personal explorations into the healing power of food I deeply respect- recommends Rosita’s fish oil and NOT GP FCLO. One must speculate why she – who healed her system of MS – chose the one over the other. Is anyone aware of research or opinion that Dr. Wahls has published re. the viability and safety of fish oils and the bio-availability and usability of their DHA and EPA? I am really concerned. I started taking FCLO by Green Pastures because of cavities and the recommendation of Dr. Rami Nagel. Well he just died of cancer at 38!!!! Suspicious much?!?!?! Well I would encourage everyone to add to their knowledge by adding Dr Joel Wallach’s information base , I started with Dead Doctors Don’t Lie in 1994 and began supplementing myself and livestock with kelp meal. But there’s of course more to it. He’s a veterinary pathologist and has done over 26,000 necropsies on over 400 species and 3000 autopsies on humans. He discovered in NASA monkeys that selenium deficiency causes cystic fibridis and was blackballed from research because they insisted it was genetic. He wrote a 2000 page tome called Diseases of Exotic animals. He turned to humans and recommends 90 essential nutrients, including at least 60 trace minerals. He has studied the centenarian cultures, there are still 10 left in the world today , and they all get 60 to 72 trace minerals with unfamiliar names. Oddly, he is not too familiar with Weston Price’s work. He is weak on vitamin K2 and coconut oil but he’s pretty strong everywhere else. He’s the one that got folic acid added to all white four products, but he also found in 2015 that rats metabolize folic acid while most humans don’t, so that’s a new change not yet caught on. I am devastated to hear about Dr Nagel, he could not have been getting the 90 essentials. It’s all well to work at getting a our nutrients from food and not need to supplement but with the soil minerals deficiencies, which Price definitely covered in Nutrition and Physical Degeneration, it has only gotten worse. And it’s even more imperative to supplement. All I can think about Dr Nagel is what was he missing? Because that’s what I think in solving my health mysteries. I am constantly scanning the basics just in case I forgot something. I am reading a biochemistry textbook now to get more detail. Dr Wallach has other YouTube vids and talks, very interesting and entertaining. He’s in his 80’s now and spry as a spring chicken. Somebody Needs to go To Jail, Dead Athletes Don’t Lie, and Black Gene Lies. His books are Immortality, Rare Earths, Forbidden Cures; and Epigenetics. Those are the ones I’ve read, I’ll be getting more. I learned kelp meal as a lone source of the 60 minerals is not enough, it only gets the Japanese to their 80’s. He covers individuals who incorporate their wood ashes into their gardens. There are centenarians in that group. He lusts the minerals in all his books, and dome if the rocks that have them, shale and limestone look like the best. I can access limestone, and get it cheap and have eliminated pests from my garden. It gives the plants what they need to repell the buggers. Also dolomite for the calcium and magnesium. Wallach is Big on calcium. He’s the only one I have ever read that does this. Since he shows all diets are way high in phosphorus, everyone needs to supplement with calcium to balance it. He also points out the only good calcium supplements , 25% absorption , are calcium hydroxyapatite and ca citrate. All other forms of supplements only net you 14 mg per gram taking absorption into account. But all the scary pronouncements against calcium, there of course are so many members of the calcium team that negate this fear. Mg, boron, copper, zinc, vitamin A,D,C,K2, lysine even, silica, gelatin, manganese, I probably missed some. So add Wallach to your toolkit. He’s great. And no you don’t have to buy his Youngevity, there are finally several vitamin companies that have caught on to the quality multiple that I am grateful for the competition. That use the humic shale minerals too. Pardon my typos, darn stupid phone loves to change my words to gibberish sometimes. I am taking FCLO now for tooth decay and a magnesium regimen that I am doing, I don’t notice anything detrimental but my vision has not improved – my near vision started deteriorating last year, not sure if it was around the the time I started taking the FCLO capsules again. A few years ago, I ordered multiple bottles from a 3rd party source, and some of the bottles were sitting in my house for awhile and for some time in the refrigerator. A couple of those bottles smelled really foul – I tried taking the capsules and couldn’t continue. Then I developed a histamine reaction (I had histamine intolerance – some of the negative reactions could be histamine intolerant people not being able to handle fermented foods). It took more than a couple years to get back to normal, and now I can eat fermented foods with a fraction of the reaction that I used to have. I feel Dave and Sally or WAPF should do a more thorough job of addressing some of these concerns. For example, I have seen several people say their Vitamin D levels went down taking FCLO and went back up after getting off of it. I wish all the CLO companies would do a survey measuring the Vit D3 levels of people before and after taking their CLO after a good enough period of time. That could address any doubts about the Vit D3 not being enough or the Vit A being too high in ratio to the Vit D3. Overall, I think it’s good that Green Pastures got put on the spot because I think their product is better now than it was when I bought the capsules. I notice my bottles now say it is made from Pacific Cod. I think it’s challenged them to make sure to make a better product and be more accountable. I want to add Rosita did not answer a couple questions I had for them. First, where is the olive oil from (because 70% of olive oils out on the market are fake or diluted)? Also, is leaving the cod livers at a slightly higher temp than the ocean’s cold waters enough to get the amount of oil they need out of the livers? I forgot my other questions. Can you recommend a good brand of Cod Liver Oil? I’m no scientist. Can’t do any tests on vitamins and such that I take so I have to simply rely on my common sense and logic. Ive never taken FCLO/etc. I’m quite new to the work of Dr. Weston A. Price. Im learning about all of this in a search to heal/disinfect one of my molars pulps/roots. Weston A Price has earned my respect due to his apparent and significant contributions to humanity. Unfortunately, I’m finding it much harder to respect the foundation built upon his name: WAPF. Perhaps this is silly of me, but I do not feel like it is being run properly. In my search over the past few weeks, I keep stumbling upon anecdotes of the foundations President, Sally Fallon acting as little more than a bulldog that demands blind obedience and trust. Strikes me as very odd. Throw in the fairly opaque wall between “us” and Mr. Wetzel’s practices as well as how he has apparently treated existing customers with legitimate questions and all I can say is that gives me a bad vibe. I am not brand loyal, at all, so there will never be any `benefit of doubt` for a company. At least not from me. A company with nothing to hide could have easily used Dr. Daniel’s report as another growth factor with a bit of simple transparency. That didn’t happen. I bought some of Carlsons CLO (wasn’t aware of cold pressed at the time) a few days ago. If I take one of these CLO pills along with Butter Oil or Ghee, will I activate the desired X Factor? Also! Any recommendations for healing my tooth, I’d love to hear. I’ve seen lots of benefits for many people to whom I recommend the FCLO + Butter Oil from Green Pasture. I stopped taking it for over a year and after starting back on it, noticed huge improvements in my teeth health. Other than all the back and forth I see here, the results speak for themselves for me. Thanks for your elaborate and sincere testimony. When one dwells into ‘dirty polyticking’ (yes) arguments in online forums, one very quickly gets used to the idea of and cognizant of, ‘trolls for the other side’. And this obviously Contrived Controversy about Raw Food FCLO, food for Vikings (but not for picky, fuzzy, sickly, under-nourished, and pampered weaklings…), proved, at least to me, that it was a sham. With this ‘rancid’, ‘poisoned’, and ‘pollock’ FCLO, I sleep longer, do not snore, and the enamel on my teeth repaired quite visibly over a period of a few months. But after taking this raw food supplement for almost four years (Mint flavored, as Cinnamon proved very strong on the throat), I wonder, when can I expect it to make me sick…? I’m just now getting around to reading this, but I want to thank you for taking the time to write such a thorough analysis. My daughter takes 1/2 teaspoon of unflavored FCLO most days, and she loves it. My husband and I have been taking a teaspoon a day for over 4 years, and we both think it tastes agreeable. Neither of us are very picky eaters and we both like seafood, so I think people who are not accustomed to strong tasting foods would certainly have difficulty with the flavor. We have seen a reduction in the amount of simple contagious illnesses in our household since beginning to take it (our diet has otherwise not changed), and my husband had a cavity that healed and confirmed by his dentist. I know all this is anecdotal, but I believe there are always things we won’t understand about food and nutrition. It’s extremely complex and a wonderful mystery that God gave us to try and tease apart. It seems sensible to believe that there are benefits to a variety of foods for many people, and for other these foods may not provide as much benefit, but these things can be difficult to measure. Thanks again, and I appreciate your balanced and analytical approach to this tough topic. I have taken Green Pastures CLO for 4 years and my most recent batch was BAAAD-were returning it!!! Never had that issue before! I know never eat anything that smells off. I made that mistake after ordering from Cultures for Health- they sent me kefir grains with pink mold on them! My health spiraled downhill FAST! My son almost died – those idiots never even responded to me! Thank you for your preliminary thoughts on Dr Daniel's study, it's really thorough and enlightening. I wanted to know if it was still safe, in your opinion, for my pregnant wife to use GP FCLO and HVBO after everything that has been said about Green Pastures these past weeks ?? To tell you the truth, we got kind of worried when we saw Daniel's study an, as we live in France, we don't have access to EVCLO. Anyways, I guess GP FCLO is much safer than the usual deodorized CLO found everywhere, but still we don't want to take any serious risks with my wife's pregnancy. Please help us 🙂 ! Thanks again for the post above and thanks for all the work your doing to improve everyone's live. The oil of fermented livers is NOT EQUAL to fermented oil. Essentially, calling it fermented oil is something any lipid expert would immediately scrutinize. Questioning Wetzel HARD on this is something that should have occurred years ago. "In a colloquial sense of having been metabolized by microorganisms, this seems accurate." I imagine that fermentation in the biochemical sense has occurred in the livers to one degree or another. I assume there is some glycogen in the liver that ferments in this sense. He’s defending the hocus pocus and avoiding the simplicity that carbohydrate (glycogen) ferments, proteins putrefy. All the talk on brown vs light oil is immaterial. …but amino acids can be fermented. Chris, could you please comment on the possible presence of the Trans fats. If you assume that the tests were reliable, is 3.2% a significant level of trans fat that you would recommend people avoid the product? Also you wrote: the lab test does not seem to distinguish whether the 18:3 trans is all-trans, or is conjugated with alternating cis and trans double bonds. Could you comment on how this is significant to the negative health effects of trans fat, whether it is all-trans, or is conjugated as you describe? In short is one of them safer than the other or is it just a question of where the trans fat is coming from? Thanks, Chris, for your thoughtful and thorough comments. When I started to use FCLO I had a difficult time. I burped non-stop all day, taking small amounts either with or without food. The taste was absolutely disgusting and was my first experience with any type of fish oil After several years, this has gone away–completely. My health is better than it ever has been following the Weston Price guidelines and people tell me I look 10 to 20 years younger than I actually am. These comments come unsolicited and I now just smile and will often ask the person if they need to have their eyes checked. There is a saying that if you love your food, your food will love you. And that if you think something is bad for you, it probably is. Our minds are powerful influences over what we think is right or wrong (pun intended). Just look at the data on the placebo effect and how many people experience the "adverse drug reactions" simply from a "sugar pill". I'm probably wrong with this, but I think I remember that only 3% of the individuals noticed no effect at all. Where are we going or coming with all this navel watching? PS I hold a PhD in natural products chemistry from Stanford University and am a naturopath too. I've taught meditation for many year for Deepak Chopra and I feel that I now partially understand how important it is to balance our lifestyles (and nervous systems). I have been taking FCLO for 2 years, when i was getting it from GP it was always dark brown and nasty tasting, i ended up getting it from a place in california where the taste was better and was a lot lighter in color, still GP, what is disturbing is "if" its alaskan pollock, and GP is representing it to be cod, then what else about it could be misrepresented, I have stopped taking it at this time, until some true proven facts come out. something interesting about Free Fatty Acids. In high amounts they accelerate peroxide decomposition. When adding higher amounts of FFA, ox-TG and TGP increase ata slower rate respect to the puriﬁed oil without FFA. The carboxylgroup of FFA has shown a catalytic effect on the decomposition of hydroperoxides (Miyashita & Takagi, 1986): our ﬁndings could indicate that FFA are prevailingly involved in accelerating peroxide decomposition, more than in their formation. As a consequence,also the polymerization of polar triglycerides is limited.Therefore the role of FFA in the oxidation of triglycerides ap-pears to be the result of different phenomena and interactions tak-ing place in the system and depending also on the amount of FFA"
So we may not be able to find peroxides, then next we need to trace the secondary products of oxidation, aldehydes, which are highly toxic. “aldehydes have a strong sensory impact, imparting off-flavours to fish oil” So the strong off- smell can be an indicator of oxidation. “the compounds which seem to pose the biggest risk in terms of negative health effects are volatile oxidation products, particularly a number of different unsaturated aldehydes. Although some of these aldehydes might be detected by the anisidine value, this method is not specific and one does not really know what one is measuring. The only method which can measure specific volatile oxidation products is the GC method …. In contrast to the anisidine and TBA test, gas chromatographic (GC) methods to determine secondary oxidation products offer the sensitivity and specificity that the former methods are lacking. GC methods are thus capable of determining volatile oxidation products that either contribute to or serve as markers for the off-flavor formation in oxidized lipid containing foods." Chris, are there any other aldehydes that the NMR test has not tested for? It only tested for 7 or so of them. Or are these the only aldehydes that exist? We have had nothing but good results with the fclo and bo. We started it about 9 yrs ago and my kids have not had to go to the doctor since starting this. We do not eat perfect by any means. We take during fall and winter. Chris, thanks for the detailed preliminary analysis. I started taking GP high vitamin CLO back in 2006, about 1/2 tsp per day, and I still caught one or two colds a year. When the GP FCLO came out I started taking it in June 2009, not quite 1 tsp per day. I have not had any viral respiratory illness (no colds or flu) since. I used to get 3 or 4 colds every year all my life up to 2006, so no colds in over 6 years is a miracle for me. I know this is n=1 and other changes I made to my diet, like minimizing added sugar and "vegetable" oils, could also play a role. I know that some diet researchers like Paul Jaminet recommend not using CLO, but it has been great not having any colds for years now, so I am reluctant to quit. I did however reduce my dosage for the summer to about 1/2 tsp per day FCLO but plan on increasing back to near 1 tsp per day later this fall in preparation for the next cold season. So, Chris are you taking any fermented cod liver oil? I take it in the coldest four months of the year in small doses or when I feel the need for immune support and have no current plans to change that practice. What about the acid values that clearly show that the oil is rancid? I don't think this has been addressed? English, these Acid Value numbers are extremely high. It has, please see all my comments on hydrolytic rancidity and free fatty acids, which is what the acid value is a measure of. It would be nice if somebody addressed the point that "EPA and DHA are much more unsaturated than ALA" and hence much more unstable then even flax oil. How can EPA and DHA handle the long "fermentation" process? Why wouldn't they oxidize and go rancid as expected in biochemistry? Without antioxidants, fish oil is massively degraded within 48 hours, and even with a huge amount of antioxidant there is still considerable degradation (Gonzalez, 1988; Klein, et al., 1990). even oil stored in the dark at 4°C may oxidize unacceptably within a month of storage . Added antioxidants reduce but do not prevent oxidation . I have replied to that comment above now. The science and evidence is overwhelming in favor of the benefits of CLO, including partially pre-digested FCLO. No evidence was found to even infer that FCLO causes inflammation. A healthy diet that excludes processed foods, especially sugar and starches (grains, beans, corn, soy, potatoes and (most) rice; and that includes copious amounts of whole fruits, vegetables and berries, along with fat soluble vitamins will provide antioxidant uptake capable of naturalizing most inflammation, (genetics aside). See Glutathione in the search box this site. I find this rather mystifying because I once got a bad batch of a more mainstream brand of fish oil during a particularly hot summer. It was in capsules, so I didn't know it was bad. I very quickly developed gum inflammation. I immediately asked myself what was going on, because I knew Omega-3s are anti-inflammatory and that this inflammation shouldn't be happening. I also knew Omega-3s oxidize very easily and that it was very hot. So, I stopped taking the fish oil and the inflammation went away. Now, if I get I supplement, I tend to get krill oil because it is more stable. I prefer seafood, though. But, the issue I have here, is that I find it hard to believe a ton of WAPF people are walking around inflamed without ever making the connection. OK, yes, I know it is easy to eat crap for years without realizing it is damaging you, but whatever, the inflammation should be there, noticeable, and provable. Either the customers have it, or they don't. My guts say that I cant have anymore FCLO. I will switch for a product from the Nordic Countries. So, Chris, you say you don't take the FCLO yourself? I say above that my practice has been to take small amounts in the coldest four months of the year. I agree that all orgs have limits. But when a board member (Vice President Dr Daniels) still raises questions and is shut down the board risks things blowing up if important questions that appear to have been thwarted are shunted aside. You might go read David Gumpert's newest blog post on "the complete patient". He's done a much better job than I at defining the issues. She wasn't shut down by the board. They had tested the FCLO last December and published those results in February (if I haven't got my dates mixed up) and saw no reason to re-test. Dr. Daniels apparently wasn't satisfied. Nothing wrong with continue to study it on her own, but the tone of her report and her willingness to immediately assume fraud and deception are not hallmarks of scientific impartiality. "I'm very disappointed in how this discussion came about, in my view because the WPF board refused to do the research"
This is just plain wrong. WAPF did some tests and found them satisfactory, but they have no obligation to test the products that they endorse for conforming to their dietary guidelines. What do you want them to do next, pay to have all the raw dairies tested? If your expectation of WAPF is that it is perfect, all knowing, all powerful and with endless resources, then sure, let yourself be disappointed. Thanks Chris for your years of work. I've followed you for some time. We all should embrace debate for sake of a healthier outcome. I'm very disappointed in how this discussion came about, in my view because the WPF board refused to do the research under Sally. It wasn't a case of money (my personal opinion). What's being missed here as we debate and joust my lab is better than your lab, is does FCLO induce an inflamatory response in the human body or not? This is Dr Ron's point, and question. I would like for THIS point to rise to what's being focused on. Will the path to deeper understanding of FCLO vs CLO vs inflammation require mice or rate studies? If it does it can't be soon enough. Re vitamin K in FCLO? I have a bleeding condition that is an excellent barometer of my high Kxx status. FLCO does nothing for me. LEF.org 's K3 pills 2x a day keeps it in check. Aged gouda added in for bad weeks. FCLO doesn't seem to help me at all. Re vitamin Dx. Again my blood tests come in low on many years of 1t / day or a bit more. So now I'm taking oral and patch D3. Dr Daniels tests seem to corroborate my body's indication of FCLO's vitamin content. Re FCLO's rancidity? I heard that Green Pastures FCLO had sky high anti-rancidy factors. I take the liquid oil by mouth, not capsules. I don't mind the initial taste. I can tell you that by end of month 2 taste has definately gotten much stronger. Now that this topic has broken, I believing there's something odd with the stability of FCLO. I would suggest testing 90 day old half empty bottles of FCLO NOT fresh opened bottles. After all this is how consumers take this product and thus how hearts and maybe brains are being affected? Lets poll families, how many save the FCLO/CLO for sickness and the bottles are actually quite old? We need to know if this is a healthy practice? A poll may be interesting but of little value in looking at biological effects of the oil. It would be wonderful to have experimental evidence of biological effects, especially in humans. It would also be costly, labor-intensive, time-intensive, and require a lot of creative input. Hopefully we can have data like that some day. Did you just say that you expected cod liver oil to help with your bleeding disorder? You know that Vitamin K1 is not the same thing as K2, right? It's the latter that is believed to be in FCLO, not the former, and it's the former that helps blood clotting. Nor should anyone expect that FCLO alone could raise terrible D3 levels. FCLO is an excellent food because it's a *whole* food, with naturally occurring levels of micronutrients, in their naturally occurring ratios. It's not a multi-vitamin, with high levels of certain nutrients that you could never get naturally. My children's teeth completely stopped their rampant cavities when we started taking the FCLO. That shows well the balanced levels of A, D, & K2, so far as I can tell. It's likely that Kaayla Daniel's edge of anger arose when her reasonable questions were ignored. I'm still grateful for her book The Whole Soy Story and her other work on nutrition. A good editor would have helped her voice be more dispassionate, and raise questions instead of make judgments where data was skimpy. Nevertheless, the more transparency the better, and Kaayla Daniel has helped us all see that. Ditto for WAPF, an organization that the world beyond our chapters will someday recognize as a major contributor to rebuilding health everywhere. This is a lot like two dear friends having a spat. Many such arguments boil down to insufficient information. Thank you, Chris, for you excellent example of putting aside emotions and digging for the facts, which revealed a number of examples of how misconceptions arose. Since the folks on both sides are sincere and dedicated, I wonder why they can't sort it out. With friends like these, we don’t need enemies! Considering that the Standard American Diet is child abuse and our goal is good nutrition for all, we can’t let this argument side track us. Get a good arbitrator! It’s a rare lawyer that actually helps people find consensus, so I hope that is not the path taken. Hear hear! Yes, a good arbitrator/mediator would be the way to go, in my opinion. I really hope this doesn't go the legal route either, I don't think it will be good for anyone, public health interest being #1. Thank you Chris, it is always a pleasure to read your careful and clear-headed analysis. I look forward to reading your more extensive discussion of vitamin D.
I'd like to comment, not because I can add any information to the debate, but to support some of the comments above, and add another thought. Yes, I tried GP CLO and butter oil for several months, I can force myself to swallow anything if I think there is a health benefit. The rancid flavor finally got the better of me, with uncertainty as to the health claims of this product seeming dubious. I believe Chris has done a conscientious analysis to the extent that it can currently be performed. Thank you for taking the time and making the effort. I think that Dr. Daniel's tone is a result of the frustration she has felt in being stone-walled by WAPF when questioning GP products. At least that's the sense that I get as read it. She just typed it as she felt it. The tone does not matter. What matters is the truth and the science. Anyone complaining about 'tone', 'professionalism' and the like is just trying to attack the messenger in order to denigrate the message. Would the 'tone' be innapropriate in a scientific paper under the standards of professional eticute? Probably. But this wasn't meant to be a scientific paper but one meant for the general reading audience and so other stylistic approaches are entirely appropriate. Not only that, but the tone to me was rather subdued compared to how many consumers have field about being deceived. I disagree. Tone reflects a person's intent, their reason for doing what they are doing. People make decisions based upon emotion. People can be swayed by emotion, their own, or another's. Science is especially vulnerable to human emotion. Human emotion can unconsciously and conveniently leave out "key data", skew the data to match their emotional stance and overall make one blind to obvious truths that don't need a test to back it up. Ms. Daniels' "tone" in her report is of the sort that she need not have any real data to back her up. Many people will see "PhD" and "VP of WAPF" and will then take everything she says as the truth, because the science is beyond them. The fact that she has some test results, which are at best bringing up questions (Which tests are the most relevant and valid ones? ), is certainly worth discussing more, but not a smoking gun. I think Ms. Daniels, assuming her entire report is true (which I already believe over 80% of it is not), handled this very poorly. It comes down to trust. I don't trust her ability to handle this sort of information, at least not currently. I'm sure she has the ability to do so, but this was a big flop. I think she should have at least consulted with more professionals (and if she did, she didn't do enough!) and written her report just as Kaayla, not as the Naughty Nutritionist. Read her recent rebuttal to the Healthy Home Economist…she comes across as a real person, one whom I can trust much more. I can trust where she is coming from, I can feel her actual care and not just her hell-raising attack against Fallon/GP/WAPF. I was already a GP customer when I approached David Wetzel over email with some questions regarding seafood sustainability (I’m a marine ecologist, so I am particularly interested in sustainability questions). The short of it is that I wanted to know, given how common seafood mislabeling is, how GP ensures that their product is what it claims to be. How do they know it’s cod? How do they know it was sustainably harvested? Do they know their suppliers or do they just communicate through a middleman? Not only did David Wetzel refuse to answer my questions, he basically told me to f-off and never contact him again. I was dumbfounded. Based on their lack of transparency on this matter and on how rudely I was treated (even after stating I was a faithful customer) I would never again recommend their product to anyone. Oh and the last batch of FCLO I did consume did taste awfully rancid to me. Well, I'd like to bring up a somewhat larger question that has kept me away from CLO in general, and that would be comparing some of the manufacturing differences between a couple of the top-tier flax oil producers (Flora and Barlean's) vs your typical CLO and fish oil manufacturing. What I've found interesting is how much care the formerly mentioned manufacturers take to produce and bottle their flax oil: It's produced in a light, oxygen, and heat free environment and then nitrogen flushed in the bottle. The purpose for all of this, of course, is that flax oil – which is mainly alpha-linolenic acid – is known to go "rancid" pretty quickly. So, this is what bothers me: How is it that ALA needs such careful extracting and bottling to prevent rancidity, whereas CLO, and I am mainly talking about the DHA and EPA components – which are super unsaturated and pretty much the most highly unsaturated oils consumed by humans – do not?? EPA and DHA are much more unsaturated than ALA. They are found in cold water fish because with little UV exposure and such cold temperatures, they remain fluid and stable. So, when we're talking about "fermenting" fish oil basically under circumstances that in no way resemble the kind of way quality flax oil is handled AND we're talking about consuming those oils and putting them into a 98.6 degree body, I have a hard time swallowing it, if you know what I mean! No reply, not surprising. Ignore basic science, ridiculous! He did already discuss that the fish oil is not what is being fermented. Perhaps you didn't catch that part. It is the livers that are. That process is what yields the oil. The process for creating the different oils (flax & CLO) are not the same. This does not mean they both can't have the same end result- i.e., preventing rancidity. And Dr. Masterjohn says here in his article that from his initial examination of the evidence provided thus far, that he does "not think the oil demonstrates a history of lipid peroxidation, and in the sense of the "fat chemist," I do not believe it is rancid." I'm sure he doesn't have the time to get into replying to every reply here. But, he has addressed every concern that Dr. Daniel posed. And he has further clarified here as needed. I wouldn't look for replies to every comment. I would look for further responses from him as further info is collected and some of his unanswered questions begin to get answered. It's a fairly complex set of issues. Some more than others. And I am glad Dr. Daniel raised them. However, personally, I wish that she had been professional in how she proceeded to deal with the information. As a VP in the WAPF, I would think she had a responsibility to handle her concerns and share her information in a responsible manner. Her ebook smacks of yellow journalism. I have no problem with her seeking further independent investigation. I do have a problem that she spent so much time theorizing on the process, rather than going to see it first hand herself. (She was invited to do this by David Wetzel himself.) Not getting the other side of a story is not getting the whole story. That is a big problem in my book. The very fact that the livers are aged and the fact that DHA and EPA are highly unstable makes all other arguments above moot. They are rancid, right from the start. The numbers don't lie. Marty, thank you for the reply. I cannot reply to everything. I reply to comments when it seems my reply can shed new light on something of interest. I did not reply to this comment because I do not have time to reply to all comments and therefore try to reply only to those where my reply will shed new light on something of interest. In this case, I already addressed these concerns in my article, and I do not see any way to reply that does not involve me simply repeating myself. — The oil is not fermented. It is extracted from microbially processed livers. — All things being equal, EPA and DHA are more vulnerable to peroxidation than ALA and LA, but liver isn't flax. I have a section on potential components of liver that could protect EPA and DHA from peroxidation. — Lab analyses show no convincing evidence that the oil demonstrates a history of lipid peroxidation. This trumps any theroetical speculations that the EPA and DHA must have peroxidized. — Please see my comments on the acid value and free fatty acids reflecting hydrolytic rancidity, which does not imply a history of lipid peroxidation. "Hydrolytic rancidity" without oxidative rancidity in the presence of "microbial liver processing", seems a little far-fetched. That would mean anaerobic fermentation which would require the addition of sugar and water to raw livers, then processing the fermented livers in an anaerobic environment to extract the oil, then encapsulating the oil to prevent contact with oxygen (obviously putting it in a free liquid form would be very bad for such a delicate product). None of these processes are done and the product is sold as a liquid in bottles, clearly you can't do that if you are preventing oxidative rancidity. The science does not add up. I get the sense that you read the Daniel report and then skipped over most of what I wrote and skimmed it if anything. I don't intend to follow up with more replies given that. Here I will only say that regardless of your personal belief in the plausibility that the oil could not be peroxidized, the lab anallyses of it fail to show convincing evidence that it has, particularly the Grootveld analysis of specific peroxides and secondary aldehyde byproducts that didn't detect any, but also the cruder analyses cited in the report, as discussed in my post above. I think you missed a few 1st year lectures. It doesn't pass what most of us learned in 1st year biochemistry. Sorry about that. Minor edit: I eliminated the statement that WAPF sent in 10 lots for testing on peroxide value, anisidine, and TBARS because these were sent by GP and WAPF simply collected the certificates of analysis and published the data on its site. This is a truly extraordinary and informative article that is not only well supported and evidence based, but fair and open-minded, (especially for a de-facto rebuttal). Obliviously, a substantial amount of time and effort was invested. Those of us who are focused on the educational value of true science based health through nutrition sincerely appreciate these efforts. Well done. It seems, in an optimal world where people ate healthy and consumed whole fruits, vegetables, the whole animals and the whole fish (especially the livers) perhaps we would have less squabbles about supplements. However, for most with hectic lifestyles getting sufficient amounts of fat soluble vitamins and DHA from the food we eat is virtually impossible. Supplements therefore are a necessity. The health benefits from a tablespoonful of Cod Liver Oil and a couple grams of high quality distilled fish oil far outweigh the risks. The oxidative stress risks can be mitigated by keeping adequate antioxidant intake levels. Dr. Masterjohn's concerns about vegetable oils (other than Avocado, Coconut and Red Palm Oils) are point right on where intake of these PUFA oils should be held to a minimum. Although, minimal intake is probably a good idea just to keep the immune system on its toes. BTW the Kaayla Daniel's site is a corporate for profit enterprise dedicated to marketing and $ales of her products/services. As opposed to valuable not for profit nutritional educational foundations and blogs. Thanks for an excellent piece of work. You've shed a great deal of light on this troublesome controversy. I will no longer purchase Green Pastures products for these reasons: 1. I think it possible to give the body all the nutrients it needs from high-quality, nutrient-dense food, except possibly vitamin D during winter, and even this can be ameliorated (as you imply from Dr. Price's use of it) without using CLO. 2. What appears to be a complete lack of transparency about the sources of the ingredients in the products (for nearly everything I eat, I know and trust the source-this is essential for me). 3. The expense is nearly beyond my means. 4. A gut feeling that there is something odd about FCLO (though entirely unscientific, discernment is an essential life skill). Thanks so much Chris for your thoughts and the time spent on this "critique of the critique" of FCLO that has rocked the WAPF world. I have had suspicions regarding this product for many years and have always felt that something was not quite right. This is just my gut instinct, however, and not science. For the lay person, such as myself, to fully understand testing methods of fish liver oils, then interpreting results and coming to correct conclusions, is impossible. We are looking to those we trust for answers, answers which seem to be elusive. I want more testing, more transparency, more dialog. I thank Kaayla for her work as well. I hope the WAPF will further investigate members' concerns about a product that is so controversial yet still receives their highest recommendation. The issue of trans fat content is particularly troubling to me. I have stopped taking FCLO as I am unconvinced I am getting a wholesome product. Dave Wetzel has a patent, available for public viewing, on the production of high vitamin butter oil. I work in a laboratory at Stony Brook University pursuing a MD for clinical research purposes. I had to e-mail Dr. Daniel's report to a colleague who is a marine biologist. He says the Alaska pollock reference is misleading, being that it is a cod fish, belonging to the family Gadidae. Atlantic cod = Gadus morhua. Pacific cod = Gadus macrocephalus. Alaska pollock = Gadus chalcogrammus. I mix a teaspoon of GP cod liver oil with raw pastured milk from a Long Island farm, and have been doing this for years with no ill effect. Dr. Masterjohn, I feel you are a remarkable scientist. Truly a blessing to the community. His feedback here gets a thumbs up. Potential Conflicts of Interest: "WAPF also paid for a semester of undergraduate courses I needed to apply for graduate programs in 2006 and funded my postdoctoral research at the University of Illinois." With this in mind it is clear that there is definitely a conflict of interest with regards to this analysis of a product so heavily endorsed by the WAPF. More independent testing of FCLO is clearly needed. Meanwhile, it is evident that a more conservative approach to the endorsement of FCLO should be adopted than what WAPF is offering to its membership, particularly given that you do agree that the product is likely mislabeled, which is illegal, and that there are likely transfat oil adulterations – being, as you state, the simplest explanation for the lab results. Chris does not state that the product is mislabeled, or likely mislabeled at any point, nor does he ever state that there are likely transfat oil adulterations. You are clearly trying to distort the narrative. This article is a clear endorsement of Green Pasture's FCLO product, and supports WAPF's conclusions and endorsement. Anonymous, you are apparently not aware that it is standard practice in scientific papers for the researchers to clearly state any financial ties and potential conflicts of interest. Conflicts of interest do not necessarily invalidate the research, it is just a matter of transparency. Chris held himself to this high standard even though this is just a blogpost. It seems obvious that you didn't actually read it — and it's not easy — because your conclusions do not follow from this analysis. I urge you to take the time to read through it. Great Job Chris. People should have an even greater appreciation of Green Pasture's FCLO products after reading this. The extraordinary lengths that Dave Wetzel goes through to produce the product, and the depth of these discussions and research is impressive, to say the least. I imagine it will be many more years yet before we are fully able to understand the bioactive nature of this FCLO, but at least we can put Dr. Kaayla Daniel's report to rest. A shame that she has discredited herself so severely with this report. I think we can argue about every little scientific detail of this oil forever, peroxide values being high and then falling, etc. It's pointless waste of time. To paraphrase, if it smells fishy, it probably is. There are plenty of oils on the market that don't smell putrified, why take the chance with this unknown mislabeled product that tastes like crap. I'll go with my nose on this, not biochemical argument. There is nothing to gain by taking the additional risk of this "fermented" oil. All the rest of the conversation is superfluous in my view. We don't have a degree in chemistry nor access to a lab, what we have is a great brain, it just knows now this product is an obvious scam if you just accept the fact that we were duped and stop with all the rationalizing. The emperor has no clothes, it was obvious to all the children who didn't want to take this foul smelling stuff. It's easy to get caught up in this "scientific" debate with pages and pages of arguments, but in reality it's pretty simple – this is a rancid oil that has been oxidized during many hours of pointless "fermentation". This is just what happens to fish oils after some time – they simply get less fresh – oxidized/rancid, just like any other not saturated oil. It was too good to be true. It was a brilliant marketing gimmick, at best harmless (not likely), at worst having a negative effect on health. Case closed. Actually, I think your case hasn't even begun. "Fishy" smells and tastes are probably due to other components like trimethylamine and its oxide rather than rancidity. Note the book I quoted that no one has ever been able to provide the food industry with satisfactory evidence that rancidity testing determines sensory perception of fishiness. And see my posts on the Cleveland group's writing on TMAO. sorry, just to clarify, it doesn't smell simply fishy, I meant to use "fishy" as in suspicious. It smells disgusting and revolting. Much worse then any other fish oil I've ever smelled. Vast majority of people would agree with this. It's impossible to take it, unless it's encapsulated. I actually like cod liver and it's oil if it's a real product in a can, you can buy it on amazon and taste for yourself. Who said that something has to be disgusting to be good for you? Why should we overwrite our natural body's common sense that this oil is revolting and force ourselves to take it hoping that it's not rancid? Chris, do you think that they have found a sure way to prevent fragile, easily oxidizable fish and other oils from going rancid with time, heat and oxygen exposure while it's "fermenting" in vats? If yes, shouldn't they patent it and use it for olive oils and other easily oxides oils to extend their shelf life? Do they have a paten pending for this? If oils are fermentable, why not try fermenting olive oil next? But my main point is still this – why take a chance with something you are not sure of that goes against commons sense? Can you come out and say with certainty that you still recommend this oil and it's not rancid? Will you ever be able to do that? Information is always incomplete, that's why we, as humans, learned to go with "rules of thumb" when in doubt. And one of these rules is – don't take stuff that smells horrible and makes you want to vomit. May be it makes sense to say that we all were mislead and there is nothing special about this oil. Nothing worth taking a risk of rancidity and potential contiminations for. I published a clear conclusion that I don't believe the oil is rancid in the sense of having undergone lipid peroxidation. Personally, I have tried to avoid making specific product recommendations, but I feel comfortable expressing my confidence that the oil is probably beneficial for people who tolerate it well. I see disagreement about the taste. There are various physiological factors that underlie the sense of taste, and the taste could relate to amines or free fatty acids rather than lipid peroxidation products. This controversy didn't come out of no where. There have been numerous reports of the FCLO having very bad flavor as compared to other brands as well as adverse reactions to FCLO but not other brands. And this is not just people new to code liver oil. Some were long term users of FCLO who found the quality suddenly changed at some point. However we want to quibble over the science, we just havn't been hearing this volume of reports from other brands or from CLO in the past. It is quite reasonable that something is wrong here. If its not rancidity, then what is it? What brands of CLO are you comparing the Green Pasture's products to? From my understanding the many if not most of the products out there undergo chemical processing that includes deodorization, so the odor and flavor of these products would be different. Green Pasture has also cornered the market for FCLO, and has a big social media presence as compared to the numerous other brands of CLO, so of course it appears that there are both more positive and more negative reactions to FCLO than other brands. Popularity of a brand also means a higher likelihood of being targeted for smear campaigns backed by less popular brands. Decisions about the safety of a product should be based on evidence, and understanding different ways of interpreting data is of utmost importance when it comes to making an informed decision. As I wrote, I think negative reactions are more likely due to amine intolerance, and I'm sorry but if flavor is the issue please deliver similar scrutiny to intensely flavored cheeses the century egg, and the whole range of fermented foods. Is it hard to find someone who likes tofu but hates natto? So you're saying the amines are unique to the fermented variety and not found in extra virgin, cold pressed, or highly processed varieties? Flavor IS an issue because that is how our bodies help us avoid bad things. But if you read my comment carefully I was not just comparing to non-fermented varieties. There have been several people who have reported adverse health affects on FCLO as well as bad taste. Some of them report this compared to EVCLO, but most importantly some of them as compared to FCLO from the previous order…. For a long time I used the regular clo from Green Pastures and then I used the fermented — with no problems until about six months ago: the plain (no antioxidants) fermented smelled and tasted like sludge. I could not get it down. "If oils are fermentable, why not try fermenting olive oil next?" if you look into coconut, you will see that fermentation is a process of extracting the oil there too. i agree with chris about flavor. the fermented shark traditionally prepared in iceland is reported by some people to be the worst smelling, most horrible tasting stuff on earth, but yet it was exceedingly fit for vikings. thanks chris for your contribution of this article! it has helped to clarify a lot of my own feelings on this issue. I recently opened a bottle of GP cinnamon tingle gel butter oil blend (Lot 20431, mfg 7/13). I can honestly report that it tastes fresh and I smell the cinnamon and barely any fish. The taste is not offensive in any way to me. I find it tastes as fresh as a new bottle. I have kept it refrigerated the entire time. I have leftover bottles that I might not sell and in that case I use them myself. I appreciate the FCLO butter oil forms because these are more convenient than purchasing them separately. This helped during a serious tooth abscess and I personally experienced it's effectiveness. However, some people can't take the FCLO no matter what I say about its effectiveness. These people might not be able to consume anchovies, pickled herring, raw oysters, sushi. fish sauces or smelly cheeses as well. Each person is different. We must also remember that for CLO to be effective, it needs to be accompanied by other foods that supply minerals like calcium, magnesium, phosphorous, zinc. When pregnant there are concerns about CLO if not consumed with meats, eggs and saturated fat, as warned by WAPF. It needs to be taken correctly to be effective. I take CLO and butter oil for the fat soluble vitamins and feel it is a good source of these based on my own experience, but not everyone may tolerate the fermented version. My kids LOVE this stuff (ages 11 – 1). They even ASK for it in winter when they are feeling unwell. Sometimes one of us will have it "burn" our throat on a given day, but not every family member has this, even though all doses are from the same bottle. The burning is probably more from a bad swallow or stomach acid coming back up. ?? Dr. Masterjohn, thanks for sharing your insight. Terrific article, Chris. Some of it was a little difficult for me to follow, but you usually summarized your points anyway, which was helpful. I'm currently in the NTP program, and one of our basic concepts is biochemical individuality. Anyone who has been in the real foods community for very long will know that some people swear by FCLO, whether or not they like the taste, and others don't seem to tolerate it. I don't love the taste, but I tolerate it. I agree that as consumers we are better off if there is more than one supplier of a particular product, and just because something doesn't work for one person doesn't mean it's bad for everyone. The amines are produced from microbial metabolism. The EVCLO and every other CLO on the market should either be free of amines or should have very low amine content that does not compete with the FCLO. The overwhelming balance of the lab data show that amines are almost always if not always present in FCLO, and that the content varies considerably from batch to batch ranging from low to high concentrations. Amines have strong flavors and can produce negative side effects in sensitive people. People who are sensitive to negative side effects are more likely to find the flavors and odors associated with them revolting. So, the presence of amines can explain these reactions. Contrast this to toxic byproducts of lipid peroxidation. Can they cause off flavors? Yes. Can they cause adverse effects in sensitive people? Probably. Are they present in the FCLO? The overwhelming balance of the evidence suggests not. Contrast this to free fatty acids. Are they present? The overwhelming balance suggests yes. Can they taste bad? Maybe, but the evidence for this is primarily in butter and lauric fats and the evidence is poor for marine oils. Can they cause adverse effects? I doubt it. So, I find it much more plausible to blame the bad taste and adverse effects on something we can all agree is present in the FCLO rather than something that no lab can show exists in it. Yes, flavors are relevant to health. They are also subjective and influenced by culture and acclimation. Someone who finds FCLO revolting in taste should probably not use it. Will they be harmed by it? Maybe, if the revolting taste has more to do with biology than culture and acclimation. Certainly they are more likely to have a negative reaction than someone who thinks it tastes fresh. There is no universal consensus on whether the FCLO tastes bad. Neither is there one on natto, or intensely flavored cheeses. For people with anime issues is it possible to build up a tolerance by taking a smudge on and building up dosage? Or I suspect other variables at play with genetics or methylation? Thanks for the explanation Chris, I appreciate your engaging in discussion here. "Someone who finds FCLO revolting in taste should probably not use it…There is no universal consensus on whether the FCLO tastes bad." …insulating/assuming this is a personal/genetic preference and not a product problem. But this fails, because long term consumers of FCLO reporting suddenly getting nasty smelling/tasting batches. This speaks to a bad batch, a contamination. Smelly cheese is always smelly. He can fall back on 'natural variation' to hand wave away the variance, but if thats always your explanation you're also going to ignore legitimate problems. Thats what bothers me, this default approach to blame the consumer and defend the product, even to the point of ridiculousness (pollock = cod so its ok to sell you fukashima fish when you thought your were buying traditional Atlantic cod). Could a long term FCLO consumer reporting foul FCLO be due to the dramatic variance in amines? Maybe. But it could just as easy be due to a legitimate, non-amine problem. Especially since Dr. Daniel's report claims that while the amine thing was a problem in the past, based on the most recent test results it appears that he may have fixed the problem. In which case, this amine thing is a red herring. Something else is wrong with it. It's called "seafood substitution and economic fraud". And it's against the law!! It’s strange that the FCLO I bought a couple of years ago was so fishy I could barely keep it down. The current bottle of the same thing today has a much more tolerable smell. Perhaps they changed it back due to the controversial pollock exposure?